Air out your spirits with sunshine and sea breezes in Cambria a village in the heart of the Central Coast of California. 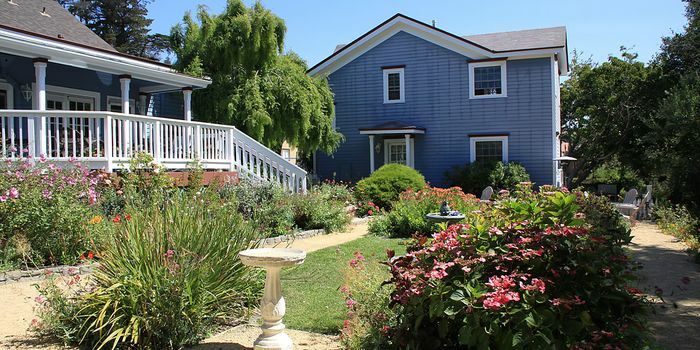 The Olallieberry Inn resting on the sunny side of the Santa Rosa Creek is the perfect home base for explorations in the region. The Inn, in service for over 40 years, has received a facelift by new owners providing modern amenities without losing its charm. Cooks in the sparkling new kitchen deliver gourmet breakfasts at two settings each day. One at 8:00 for those eager to get out and explore this gorgeous region, and one at 9:15 for those who like to sit on the deck overlooking a sweet garden listening to the twitter of birdsong. 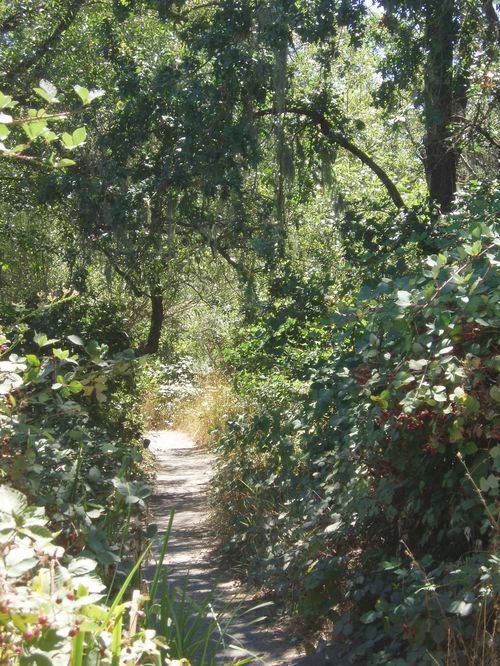 Nearby Fiscalini Ranch offers a hike through an enchanting old growth forest complete with lacy veils of Spanish moss dripping from the limbs of the windblown cypress. The trailhead off Highway One takes you to a vast meadow with a head-spinning view of the shining Pacific far below. I hiked down to the coastal bluff where a boardwalk loop that is wheelchair and stroller accessible winds through wildflower meadows. Heading south on Highway One I discovered the Harmony Headlands hike that leads you through a meadow livened by birdsong to a wild walk along coastal bluffs. If you go when morning mists are rising you will spot hawks, finches, meadow larks and more. The scent of sage and meadow grasses float on the air. This is a mellow walk on a well-groomed trail with a couple of benches where you can sit a spell and enjoy canyon views. When you reach the shore, you may run into a few local joggers on the bluff walk, but you will mostly have it to yourself. Keep your eyes peeled for a small parking lot and sign that says coastal access. There is no fee to park here. Fuel up at one of the many cozy restaurants in Cambria like the Harmony Café or Linn’s (boasting the best olallieberry pie in Cambria). Take some time to browse through art galleries displaying the work of local artisans inspired by foaming white surf crashing on black sea stacks and expanses of silver sand. Cambria is proud of the wine selections it offers with many wine tasting opportunities. I enjoyed the hospitality at the Moonstone Tasting Room where locals come to sample the delicious choices of wines from warmer inland valleys like Paso Robles and Edna Valley. I chose the Slabtown Chardonnay. In the 1800s, Cambria was known as “Slabtown” because many of the buildings were made of rough slabs of wood. Today, Main Street is lined with trendy shops, tasting rooms, boutiques and is a fun place to score antiques. A stroll on the boardwalk that lines Moonstone Beach is mandatory. Lined with a profusion of sunny yellow wildflowers in spring, it rings a stunning cove for over a mile. 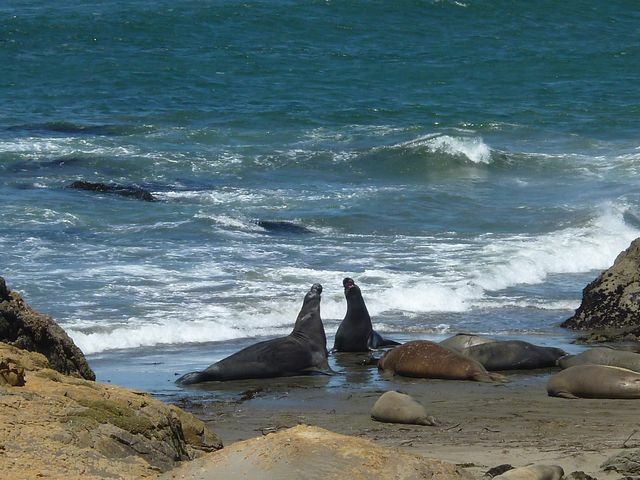 This is just one of many gorgeous beaches to explore as you head north on Highway One to visit the famous elephant seal breeding grounds. These bulky beauties spend most of their time sunbathing in summer. February is when they give birth and are a raucous and rowdy site to behold. The infamous Hearst Castle is a short ride up scenic Highway One as well as the San Simeon restaurant with humongous hamburgers made from the local grass-fed cattle on the Hearst Ranch. The trailhead on the north side of San Simeon State beach leads you through eucalyptus groves to views of the surf crashing below and the Rock in Morro Bay in the distance. 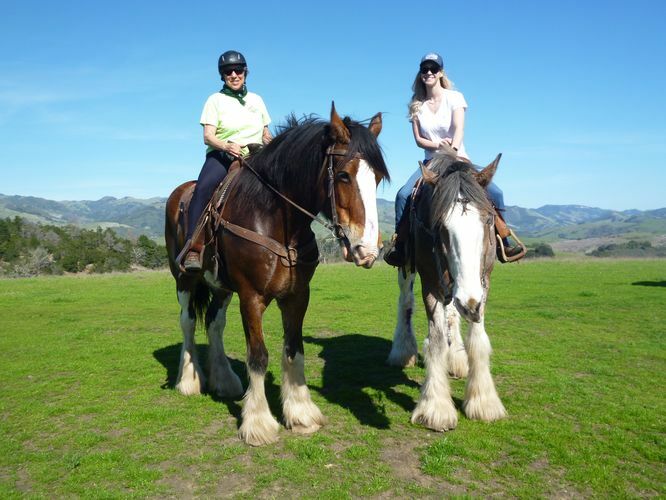 The Covell’s Clydesdale Ranch in Cambria is home to over 100 of these gentle giants. They offer rides on their 2,000 acres of privately owned land in the heart of the Central Coast. If you ever yearned to experience the vast green meadows framed in green fringes of forest and to know the intense beauty of early California, this is your chance. If you are not a rider, tours of the ranch are offered by owner, Ralph Clovell, by request. Don’t miss this special opportunity for a totally unique experience. Remember to get back to the Olallieberry Inn in time for happy hour with fine local wines and gourmet treats to share the day with other guests. Your most gracious hosts, Nelson and Maureen Hubbell, delight in giving pointers on how to spend quality time in Cambria. They made reservations for me at Robin’s, one of the finest dining options in town with a cozy fireplace to take the chill off when the sun goes down. Download the Visit Cambria app. It gives detailed information on art tours, hiking trails, shops, live music, surrounding spots, events, and lodging. 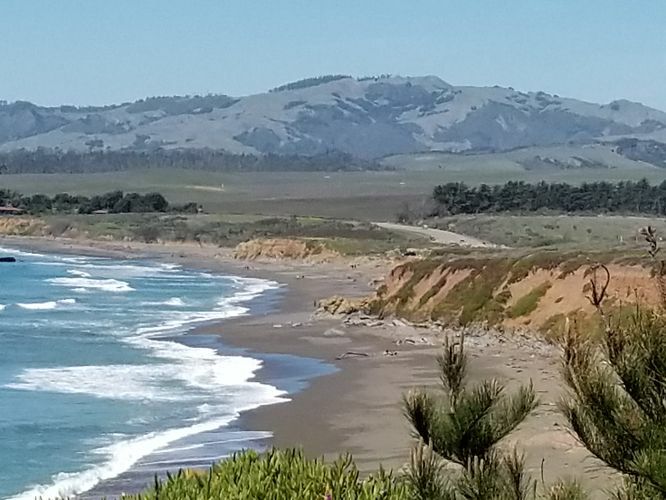 Everything you need to know for a wonderful week in Cambria—the toast of the Central Coast.